Happy Longhorns gather in a victory pile after their title-clinching victory over Pearland on Friday. Had what happened next not happened, Dobie baseball Coach Miguel Torres would likely have found himself in a heated discussion with an umpire about an out call that eliminated one of his base runners at perhaps the most critical moment of the Longhorns’ season. But what happened next – that is, what happened in the next 10 seconds, on the very same pickoff play – helped produce an achievement the Longhorns haven’t savored in 16 years. Dobie stunned state-ranked Pearland for the second time this season, rallying for a wild 6-4 victory on Friday in a showdown for the District 22-5A championship before a standing-room crowd at the Longhorns’ campus facility. The district crown was Dobie’s first since 1998. The play that turned the tide in Dobie’s favor could hardly have been more bizarre. With the game tied at 2-2 in the bottom of the fifth, the Longhorns loaded the bases with one. Then came the break the Oilers were looking for. 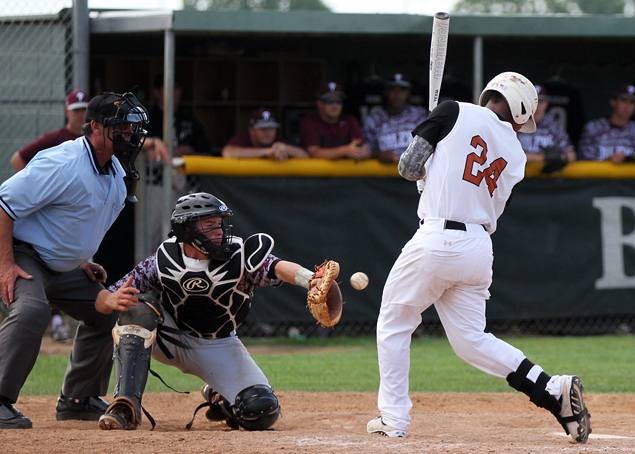 Dobie’s Travarus Ansley was picked off first base on a bullet throw by Pearland catcher Nathan Carter. But just as Ansley jumped up in protest, Pearland’s good fortune turned foul. First baseman Jake Crain, while attempting to return the ball to pitcher Brady Basso, threw it right past him. The misfire happened so quickly, no infielder was in position to back up the throw, and the ball bounced past third base into foul territory down the left-field line. Euro Diaz, the courtesy runner at third, broke for the plate and scored Dobie’s third run. Eric Garza, on second when the play started, saw Pearland’s left-fielder bobble the ball. He hit third and raced home to give the Longhorns a 4-2 lead. Torres did make a trip from the dugout to first base after the play, but not to argue the pickoff call. He merely wanted to calm down Ansley and allow his team to assess its gift-wrapped, two-run lead. The game was far from finished. Pearland reclaimed a run in the sixth on a two-out, RBI single by Kamren Dukes. But Dobie added a pair in the bottom of the sixth on a two-run double by Adrian Rivera. His two-bagger followed singles by Tyler Baumann and Tyler Myers. The Longhorns took a 6-3 lead to the top of the seventh, a nail-biter for both sides. With one out, Pearland’s Connor Wong belted a double, his third hit of the game. Dobie starter Michael Munoz then hit Jacob Barfield and Hayden Cole to load the bases. Torres then brought in sophomore Jesse Paredes, the pitching star of Dobie’s 4-1 victory over the Oilers on April 1. Paredes got the second out on a strikeout, but then walked in Pearland’s fourth run. With the bases still loaded, Perades got Carter on a ground ball to second baseman Jacob Mendoza to end the game. What remained was a two-run margin of victory, and very little argument about which pair of runs proved the most fateful. The Longhorns captured the district title on the basis of a 13-1 record with Dobie’s only loss coming to Alvin. Dobie will take a 17-8 record into bi-district play next week against Channelview, the fourth-place team in District 21-5A. Details of that playoff have yet to be worked out. Pearland heads into the playoffs with a 28-3 mark, and two of those three losses coming at the hands of the Longhorns. Dobie's Travarus Ansley is plunked on the knee by a pitch from Pearland's Andreus Faltesek, loading the bases for the Longhorns in the fifth inning. While on first, Ansley was picked off on a play that saw the Longhorns score two runs on two Oilers errors. Dobie's Euro Diaz scampers on a throwing error by Pearland first baseman Jake Crain after Crain had tagged Ansley on a pickoff. Eric Garza followed Diaz to the plate on the same play to give the Longhorns a 4-2 lead. Ansley hauls in a fly ball in center for the first out in the top of the seventh. Longhorn players mob reliever Jesse Perades following the final out of the game. Dobie starter Michael Munoz works the fourth inning. Dobie Jacob Mendoza lifts a sacrifice fly to right in the fourth inning for the Longhorns' first run. Dobie's Eric Garza slides past Pearland catcher Nathan Carter and scores on Mendoza's sacrifice fly. Munoz fires to first to retire Jacob Barfield and end a Pearland threat in the fourth. Dobie Coach Miguel Torres shakes off the chill of a celebration ice-water bath. The Longhorns pose after the game for their District 22-5A championship photo.